Well, I can say I have survived my very first cruise ever in my life. Not only did I not hurl chunks, I had one of the greatest vacations yet. The weather conditions couldn't be any better for such a voyage on the open seas. The cruise itself was short, 3 days and 3 nights. If anyone is curious about trying their first cruise, I highly recommend a 3 night cruise. 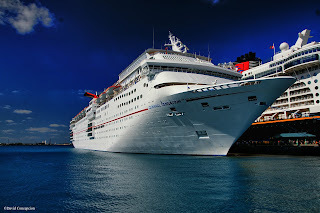 I recently joined a community called cruisecritics.com forum that is popular for rating cruises and wrote a review of the Carnival Sensation, the ship we embarked on this cruise to the Bahamas. I will post this review here as well for you guys. 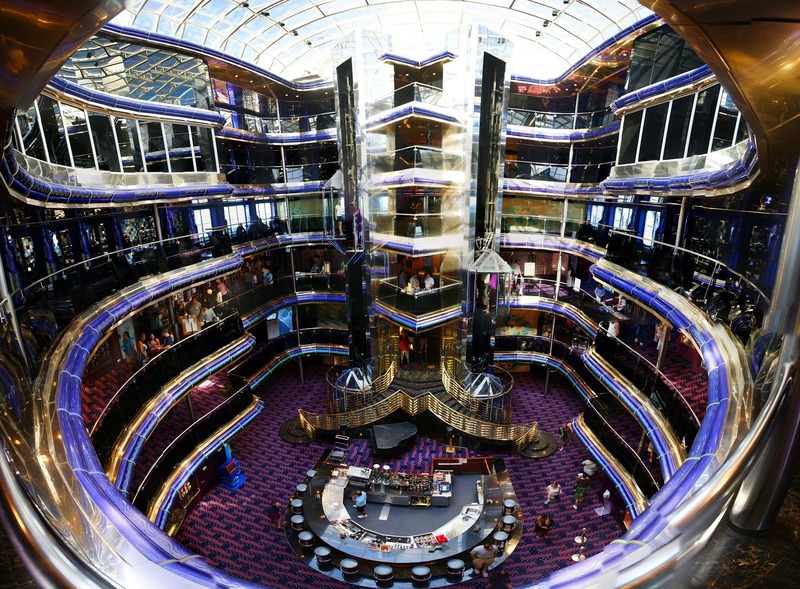 Let's get cruisin'! 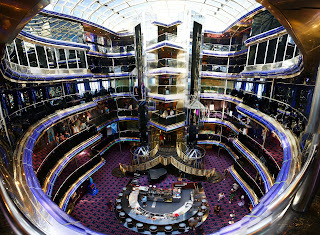 If you've never cruised before in your life, this is the perfect cruise for you. I was initially worried about the negative reviews of the Carnival Sensation but I beg to differ. I'll divide the review by days. Our cruise was 3 nights with Nassau our single Port of Call. Embarkation: We were on the ship faster than we could say Sensation. Carnival has been known for it's lightning fast embarkation and this was exactly the case. Being a first time cruiser, we were slightly intimidated by the layout of the ship, but navigation soon became a breeze and we found our stateroom on the Riviera Deck with no problems. Our room was R-34, which was an interior with no window (a curtain is there to visualize but was redundant). This did not bother us as we would not be in our room much. We met our room steward who was just finishing cleaning our room and greeted us. Since we boarded the ship so quickly, we were not surprised that he was on the finishing touches of perfecting our room so we went up to have lunch on the Lido Deck where the buffets are at. The food was quite delicious! After lunch, we went back to our room and it was ready to go. Away our luggages went. Day 1 (Departure from Pt. Canaveral en route to Nassau): We were delayed by 4 hours but unlike an airline, this didn't matter and we still made it to Nassau on time. Departing Port Canaveral late was actually a treat as we cast off shortly after sunset. Our first night was casual dinner (6pm) and the food and service were excellent. After the main course was delivered, the waiters and waitresses did a quick "dance performance" as we continued to dine. I thought that was pretty neat. Our waiter made the effort to get to know us on our first night and he was quite the character. We would even run into him the next day during our lunch on the Lido Deck buffets and he greeted us and proceeded to have a short conversation before returning to his duties. After dinner, we caught the 8pm show time on the Fantasy Lounge. The comedians were a blast and did not disappoint! We returned to our state room and called it a night. The beds were very comfortable and we were out like a light. The excursion probably took us about 2 hours and we were done just in time to return to the ship for our 6pm formal dinner. We stopped by the nearby markets to check out the local products. The prices can fluctuate via bargaining with the vendors. The 2nd night for dinner was better than our 1st night with the Lobster Tail! Yummy! For those curious about formal attire, it is recommended but not mandatory. We forgot to bring formal attire and wore what we would wear for casual, although we had designer clothing and jeans. We asked our waiter the first time and he said that they would not deny us. Speaking of our waiter, he remembered my drink of choice since I've purchased the "Bottomless bubbles" and my drink arrived before I could even have a chance to order it. After dinner, it was more comedian shows and it was just as good as the first night. Day 3 ("Fun Day at Sea"): I woke up and caught the sun rise as the ship began to leave port, bound for Pt. Canaveral to conclude the cruise. Today was the day to have fun. Since we were to be on the ocean the whole day, we really made sure to explore the Sensation in just about it's entirely and utilize the amenities on board. The water slide was fun but felt rather outdated. I remember the Disney Dream, which was moored alongside of our ship in Nassau, sporting a revolutionary "Aqua Coaster", the world's first water coaster, similar to what they have at Kalahari Resorts. The swimming pool, located about mid ship on the Lido Deck was crowded. The Sensation could really benefit the use of a second pool on deck. The Carnival "Water Works" (where the slide is at), does not have any pool and this ship seriously suffers from the lack of a second pool to fully accommodate some 2,000 people. The hot tubs seem to be plentiful as there are 2 mid ship and 2 more on the aft deck, although these are limited to adults only (Serenity Deck). Dinner was casual once more and it was a virtually a repeat of the 2 other nights in qualities of food and service. We bid our farewell to our amazing waiter and attended our final show, this one being the best of the three nights. It was an 80s theme, complete with spectacular effects to put it on par with some of the shows in Vegas. Well, maybe not, but it's close and we were fully entertained! Day 4 (Debarkation): It was quick and we immediately thought, "We need a longer cruise next time!" Summary: Our first cruise was memorable and we still talk about it even 2 weeks later! It was so memorable, that I even made a personal video using my photos and video clips on YouTube (search for "dgcpinoy Carnival Sensation" on YouTube). The crew were very joyful to interact with, the food was amazing (I especially enjoyed the Chocolate Melting Cake! 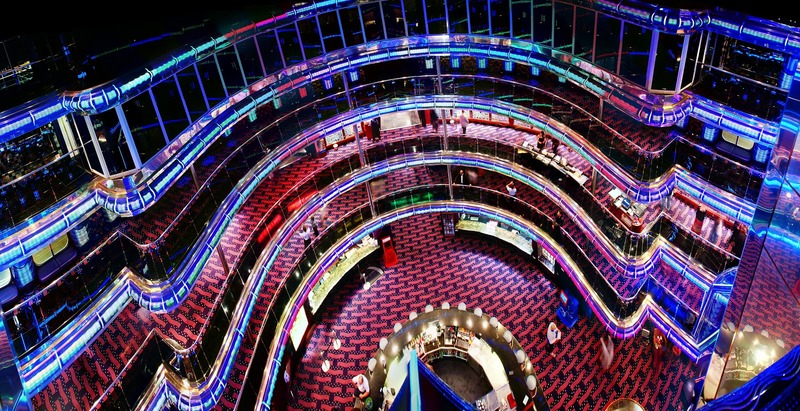 ), the fun factor was above our expectations, and the Carnival Sensation was well.... Sensational! Sure no cruise is completely perfect, but all of these were very minor and were lost in the sea of stimulating fun! We'll definitely be back on another Carnival Cruise! This weekend was filled with fun flying adventures with the Breezy Experimental Aircraft. This time, we flew around the Leeward coast of O`ahu, getting phenomenal views of Ko'olina, the Kahe power station, Ka`ena Point, and the expanse of the Leeward valleys that make up the Wai`anae Mountain Range, including the roof of O`ahu, Mt. Ka`ala. Saturday's flight was cut short due to strong winds while Sunday's weather was prime for excellent flying! Below are some photos from the flight. To view my entire album, click here.